Personal letter of recommendation is widely used by applicants to obtain various benefits like admission to universities, obtaining a scholarship, getting employment and much more. They are provided by responsible persons and hence the statements presented in the recommendation letters about the candidate are generally reliable. They also enable consultants to fetch business and show their talents. They help employees to get important job positions and enable career growth. There are many Sample Letters of recommendation available on the internet and one can utilize them. 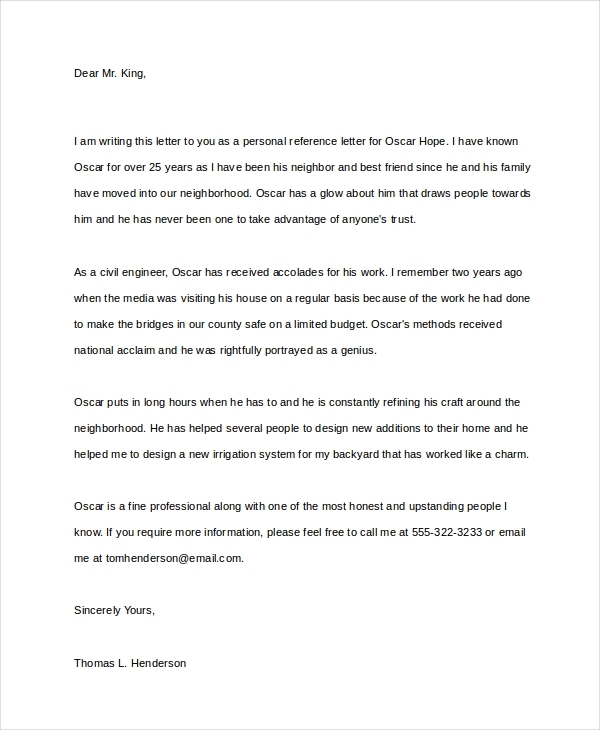 This personal letter of recommendation example is written by a responsible individual recommends a civil engineer by providing details about his caliber and efficiency to carry out various civil works like building bridges and renovating homes. You may also see Recommendation Letter Formats. 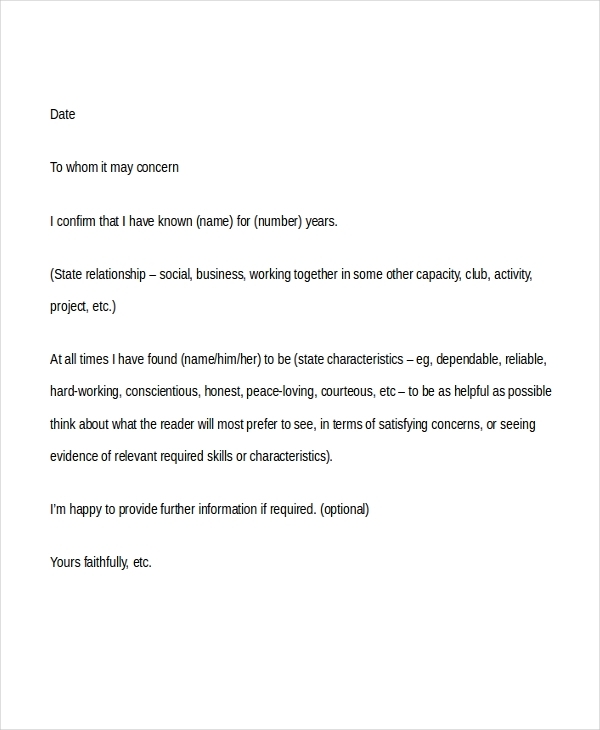 This personal letter of recommendation for a friend is written by an employee of an organization recommends his friend for a vacancy in an organization. The letter states various qualities about his friend like hard working and working with determination. This personal reference letter of recommendation presents the candidate’s abilities like documentation work, scheduling appointments, preparing brochures and newsletters, communication skills. 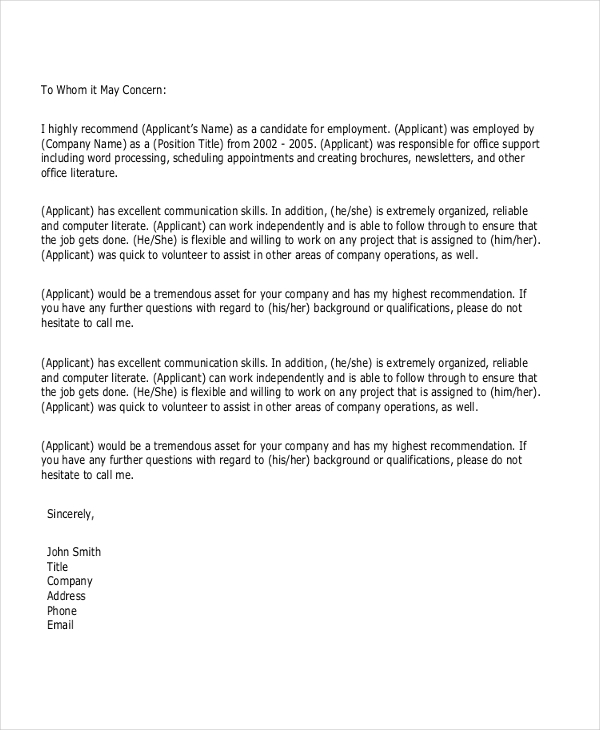 The letter also states that the candidate is flexible and can work independently. You may also see Sample Reference Letters. 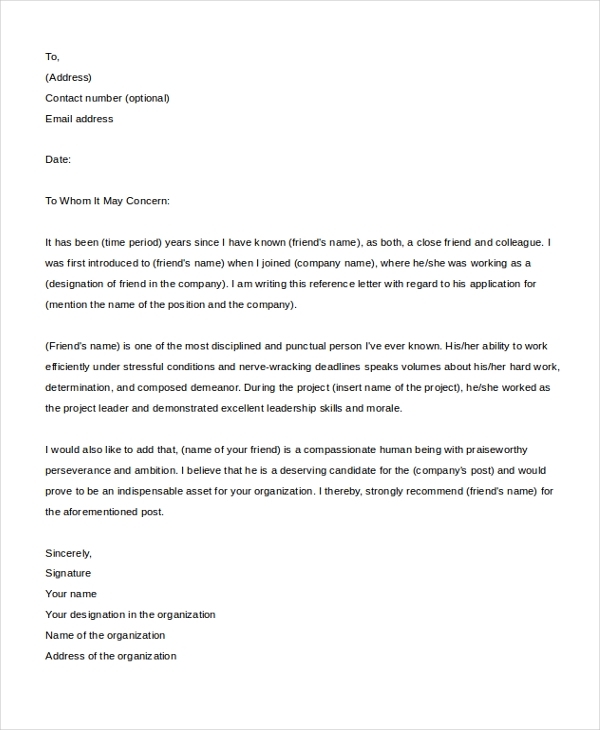 This sample personal letter of recommendation for employment states that the applicant has excellent communication skills, computer literate and ability to work independently. The letter recommends the applicant for a position in the organization. This personal letter of recommendation for college provides the details of the student and recommends his admission. The letter states that the student has qualities like hard-working, passion towards learning, etc. You may also see Reference Letter Samples. This letter of recommendation for residency presents various details that are required for the resident who is applying for a fellowship. It mentions the purpose and provides details about policy and procedures. 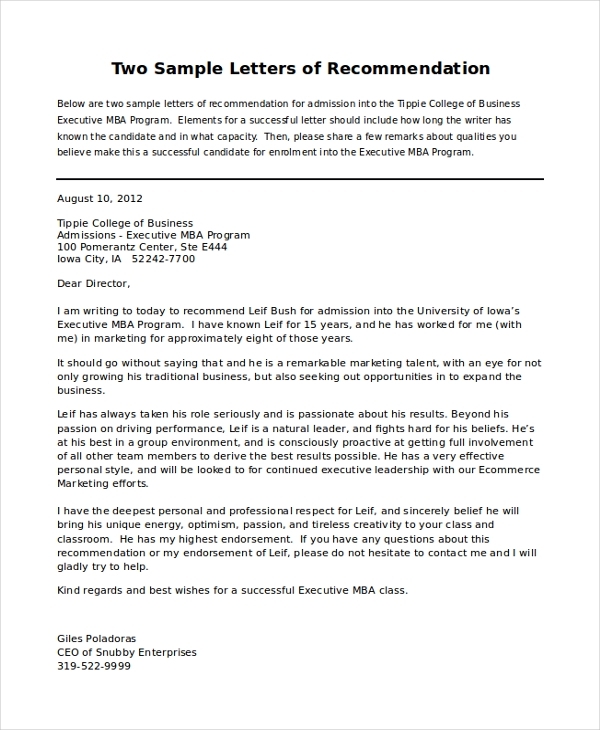 This sample letter of recommendation for graduate school is written by CEO of a company to the director of a business college recommending a candidate for executive MBA program. The letter mentions various talents processed by the candidate. 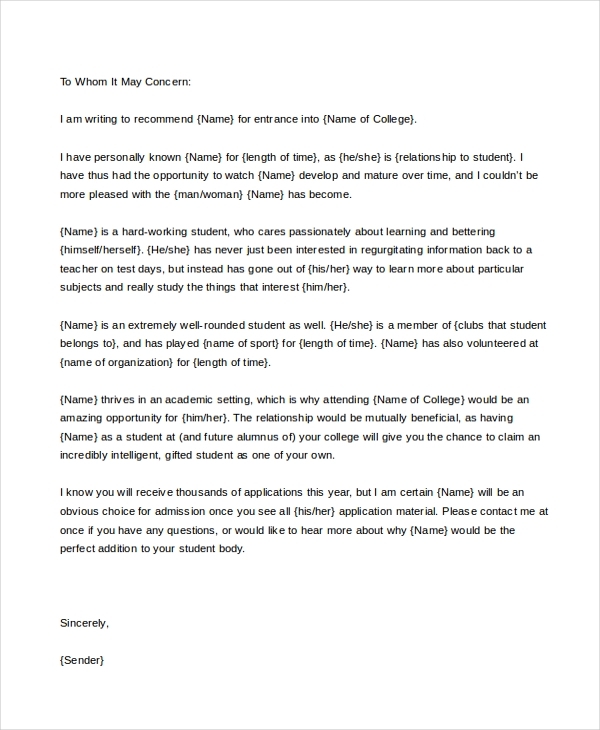 How to Write Effective Recommendation Letter? One should follow some guidelines to write an effective recommendation letter. The recipient name should be properly addressed with a salutation and their designation should be mentioned. The sender can introduce briefly about himself by providing the designation and organization he is working. The sender should provide candidate’s abilities and skills by providing suitable examples. The letter should mention for how many years the sender is familiar with the candidate. The sender should not exaggerate candidate’s capabilities and instead, should highlight their good qualities in a polite manner. And finally, thank the recipient and close the recommendation letter. You can also see Character References. The letter should mention for how many years the sender is familiar with the candidate. The sender should not exaggerate candidate’s capabilities and instead, should highlight their good qualities in a polite manner. And finally, thank the recipient and close the recommendation letter. You may also see Letter of Recommendation Samples. What are The Benefits of Recommendation Letter? 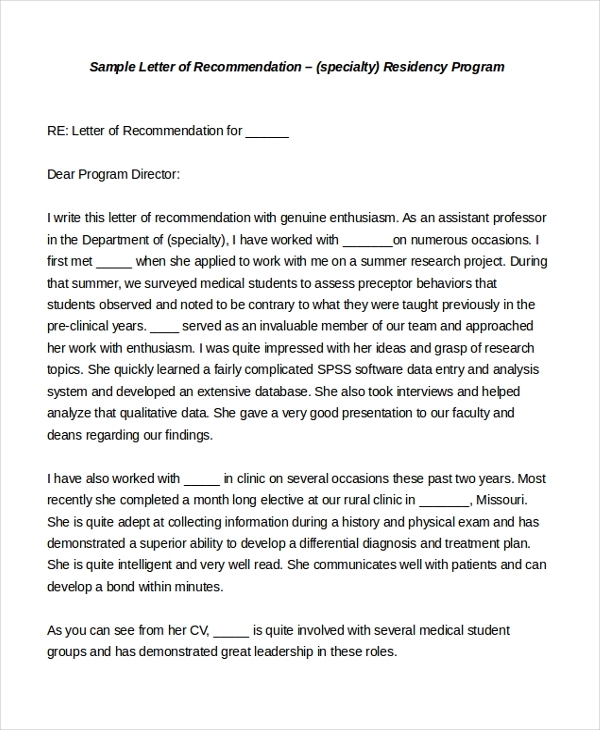 There are many varieties of a personal letter of recommendation samples and templates available in word and PDF formats. They are downloadable and allow customization as well. These samples are created in a professional manner and one can reuse them. They are most valuable and extensively used by various individuals for fetching varieties of benefits.